The 3P RainForce T series commercial rainwater controller performs all the functions you would expect of a commercial system such as adjustable pressure, duty standby/assist and BMS output, whilst remaining extremely compact. Pressure control is achieved by modulation of the pumps which are run as required to maintain pressure within a specified range, avoiding the loss of efficiency associated with variable speed systems when running at low demand. 2 Modes of operation are available, Auto Mode adds mains water to the rainwater tank as necessary. Rain Mode uses only available rainwater without mains water top-up. Unlike suction based systems which typically need adaptation for UK use in above ground plant rooms (an extra in-tank pump) Rainforce T Series can operate with pumps in any location. Submersible pumps let you take advantage of maximum pumping efficiency whilst reducing the overall component count of the system. Pumps can also be installed above ground, with an optional booster pump if required to meet specification. No water ever needs to go through the Control Panel. Operation of the pumps and solenoid can be remote from the Control Panel or not. Any electric pumps, solenoids, motorised valves, etc can be used. Single or 3 Phase (via optional contactor unit), Rainforce does not need to ‘know’ the pumps it uses. Optional hardware allows pumps of any power up to the limit of your electrical supply. Pumps can be replaced with other makes and models at any time and don’t need to be matched. Downtime due to reprogramming or lead times for a specific pump are eliminated. A precise pressure transmitter is used to determine the exact level of stored rainwater. No other float switches or probes are needed for top-up activation or pump protection, which are all software controlled. 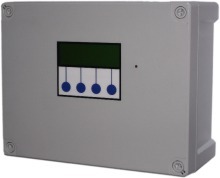 This provides the user with the added flexibility of being able to select pump shut-off and top-up levels from the panel, with no need to access the tank. All RainForce systems have intuitive menu driven settings. There are no hidden menus, and almost everything is adjustable, including pump cut-in and cut-out pressures, overpressure alarm, pump failure pressure, top up level, overfill duration, time-out alarm, etc. Safe default settings (3 bar) will operate straight away in single pump mode with auto tank level calibration. Rainforce incorporates Advanced Fault Tracking. Fault codes are stored in memory until you choose to erase them, allowing easy identification of intermittent and historical faults. Clever design of the circuit board makes Rainforce the most robust unit on the market today, with overvoltage and brownout protection, immediate recovery from power failures with no loss of setting and auto reboot, individually fused outputs, oversized power supply to electronics, removable MCU chip (software) for easy upgrades, automatic failover of pumps, and automatic search for spare pumps even if not configured for twin pump use. Modular connector design and tolerant software allows pumps to be ‘hot-swapped’ without switching off the Controller or remaining pump. Designed, programmed, built and assembled in the UK. With full UK based technical support , rapid spares availability, and spare parts supply from UK stocks. Full repair/recon service to board level. Like all variable pressure systems, a pressure vessel is required for correct operation. completed correctly and all accessories are functional. to your requirements, and full UK based support and spare parts availability. modifications commonly needed with continental systems. Excellent configurability whilst retaining an intuitive menu driven user interface. Made in Britain. Designed, built and programmed entirely in the UK by 3P Technik. sensors (no power-off). Also no need to match replacement pumps or solenoids.